So super easy, and the best time saving trick I ever discovered! Tear enough baking paper to cover the bottom of your round tin. 1. Fold it in half into a rectangle. 2. Fold in half again into a square. 3, 4, & 5. Fold the top right corner down to make a triangle, repeat this step again two more times (you will have folded three times) 6. Find the centre of your tin with the point of your triangle, cut to size at the edge of the tin. 7. Et Voila! The perfect sized circle of baking paper to line your cake tin! Tear enough baking paper to cover the bottom of your round tin. 1. Fold it in half into a rectangle. 2. Fold in half again into a square. 3, 4, & 5. Fold the top right corner down to make a triangle, repeat this step again two more times (you will have folded three times) 6. Find the centre of your tin with the point of your triangle, cut to size at the edge of the tin. 7. Et Voila! 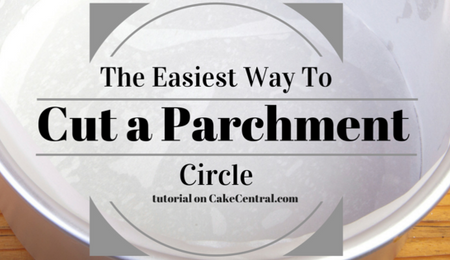 The perfect sized circle of baking paper to line your cake tin!